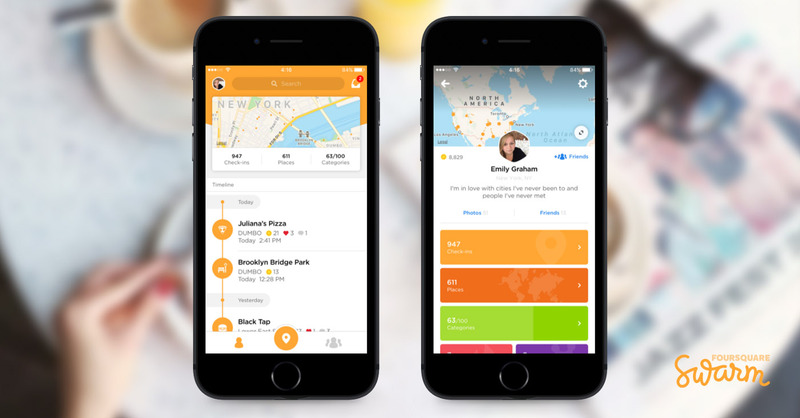 Swarm, the social check-in app that was once the fun part of Foursquare and has managed to live on its own successfully, is receiving a big update to version 5.0. This update pushes the idea of lifelogging, since most people use it for just that purpose rather than to be social as they check-in while frolicking around the world to new places. I’m not kidding either, that’s the focus of the latest update. The new update is getting a big UX overhaul that simplifies while also bringing you a new map view and stats dashboard. While I don’t have the update yet (Android version arrives in a couple of weeks), the images Swarm posted with the announcement show a user-focused UI, rather than one that includes your friends at all times. From the announcement, that’s not surprising since the Swarm stats supposedly show that people use Swarm to mark points in time throughout their life (hence the lifelogging) rather than as a social app to hangout with friends. In fact, Swarm said that most people only have 6 friends on Swarm. As a frequent user of Swarm, this sounds like a pretty big change that may take some getting used to. Then again, I do really use it for the lifelogging portion and frequently search for former places I’ve been while on travels to either recall memories or recommend say, restaurants or bars to friends who are traveling. I also like the leaderboard and the mayorships too, though. Don’t screw this up, Swarm. UPDATE: The big 5.0 Swarm update is now available on Android.